Yonkers ( /ˈjɒŋkərz/) is the fourth most populous city in the U.S. state of New York, behind New York City, Buffalo, and Rochester. The population of Yonkers was 195,976 as enumerated in the 2010 United States Census and is estimated to have increased by 2.5% to 200,807 in 2016. It is an inner suburb of New York City, directly to the north of the Bronx and approximately two miles (3 km) north of the northernmost point in Manhattan. Yonkers is known as the “City of Seven Hills” that includes: Park Hill, Nodine Hill, Ridge Hill, Cross Hill, Locust Hill, Glen Hill, and Church Hill. The land on which the city is built was once part of a 24,000-acre (97-square-kilometer) land grant called Colen Donck that ran from the current Manhattan-Bronx border at Marble Hill northwards for 12 miles (19 km), and from the Hudson River eastwards to the Bronx River. This grant was purchased in July 1645 by Adriaen van der Donck, the first lawyer in North America. Van der Donck was known locally as the Jonkheer or Jonker (etymologically, "young gentleman," derivation of old Dutch jong (young) and heer ("lord"); in effect, "Esquire"), a word from which the name "Yonkers" is directly derived. Van der Donck built a saw mill near where the Nepperhan Creek met the Hudson; the Nepperhan is now also known as the Saw Mill River. Van der Donck was killed in the Peach War. His wife, Mary Doughty, was taken captive and ransomed later. In 1942, a short subway connection was planned between Getty Square and the IRT Broadway – Seventh Avenue Line, which terminates in Riverdale at 242nd Street just slightly south of the city line, but the plan was dropped. In 1960, the Census Bureau reported Yonkers's population as 95.8% white and 4.0% black. The city's struggles with racial discrimination and segregation were highlighted in a decades-long federal lawsuit. After a 1985 decision and an unsuccessful appeal, Yonkers's schools were integrated in 1988. The federal judge, Leonard B. Sand ruled that Yonkers had engaged in institutional segregation in housing and school policies for over 40 years and tied the illegal concentration of public housing and private housing discrimination to the city's resistance to ending racial isolation in its public schools. In the 1980s and 1990s, Yonkers developed a national reputation for racial tension, based on a long-term battle between the City of Yonkers and the NAACP over the building of subsidized low-income housing projects. The city planned to use federal funding for urban renewal efforts within Downtown Yonkers exclusively; other groups, led by the NAACP, felt that the resulting concentration of low-income housing in traditionally poor neighborhoods perpetuated poverty. Yonkers gained national/international attention during the summer of 1988, when it reneged on its previous agreement to build promised municipal public housing in the eastern portions of the city, an agreement it had made in a consent decree after losing an appeal in 1987. After this reversal, the city was found in contempt of the federal courts, and United States district court Judge Leonard Sand imposed a fine on Yonkers which started at $1 and doubled every day until the city capitulated to the federally mandated plan. Yonkers remained in contempt of the courts until September 9, 1988, when the City Council relented in the wake of library closures and sanitation cutbacks and while looking at massive city layoffs, which would have been required to continue its resistance to desegregation. First-term mayor Nicholas C. Wasicsko fought to save the city from financial disaster and bring about unity. Yonkers's youngest mayor (elected at age 28), Wasicsko was a lonely figure in city politics, which was scarred with the stigma of the "Balkanization of Yonkers". He succeeded in helping to end the city's contempt of the courts, but was voted out of office as a result. His story is the subject of a miniseries called Show Me a Hero that aired on HBO in 2015, which is based on the 1999 nonfiction book of the same name by former New York Times writer, Lisa Belkin. Yonkers is a diverse community, that is well represented by many ethnicities. Hispanics are prominent in Yonkers including, but not limited to, large population of Dominicans and Puerto Ricans. Also prominent is the African American community, many of whom migrated north to Yonkers during the Great Migration (African American) from 1930's-1970's. Yonkers has cold winters and hot summers, with average lows of 20 °F in January, and average highs of 85 °F in July. In 2000, the city the population is spread out with 24.3% under the age of 18, 8.8% from 18 to 25, 30.6% from 25 to 45, 21.2% from 45 to 65, and 15.0% who are 65 years of age or older. The median age is 36 years. For every 100 females there are 88.6 males. For every 100 females age 18 and over, there are 84.2 males. Northeast Yonkers is a primarily Irish-American and Italian-American area. Though suburban, it more closely resembles parts of the Bronx than the town of Greenburgh to the north. House sizes vary widely, from small houses set close together, to larger homes in areas like Lawrence Park West, and mid-rise apartment buildings along Central Avenue (NY 100). Central Avenue (officially named Central Park Avenue) provides an abundance of shopping for Yonkers residents. Shopping centers along Central Avenue include stores such as Best Buy, Burlington Coat Factory, Kohl's, Bob's Furniture and Barnes & Noble, as well as many other stores and restaurants. Notable former residents include Steven Tyler (born Steven Tallarico) of the rock band Aerosmith, whose childhood home was just off Central Avenue on Pembrook Drive. Northwest Yonkers is a collection of widely varying neighborhoods, spanning from the Hudson River to around the New York State Thruway/I-87 and from Ashburton Avenue north to the Hastings-on-Hudson border. With the Hudson River bordering it to the west, this area has many beautiful Victorian-era homes with panoramic views of the Palisades. An interest in historic preservation has taken hold in this neighborhood in recent years, as demonstrated on streets like Shonnard Terrace, Delavan Terrace and Hudson Terrace. The population of northwestern Yonkers is probably the most ethnically diverse in the city. Neighborhoods include Nepera Park, Runyon Heights, Homefield, Glenwood, and Greystone. Landmarks include the Hudson River Museum, Untermyer Park and the Lenoir Nature Preserve. The significant amount of surviving Victorian architecture and 19th century estates in northwest Yonkers has attracted many filmmakers in recent years. Southeast Yonkers is mostly Irish-American (many of the Irish being native born) and Italian-American. Many of the businesses and type of architecture in southeast Yonkers bear a greater resemblance to certain parts of the Bronx, Brooklyn, Queens, or Staten Island than to points north. This is not surprising as southeastern Yonkers is largely within walking distance of the Riverdale, Woodlawn, and Wakefield sections of the Bronx. Many residents regard eastern McLean Avenue, home to a vibrant Irish community shared with the Woodlawn section of the Bronx, to be the true hub of Yonkers. Getty Square is Yonkers' downtown and the civic center and central business district of the city. Much of southwest Yonkers grew densely along the multiple railroad and trolley (now bus) lines along South Broadway and in Getty Square, connecting to New York City. Clusters of apartment buildings surrounded the stations of the Yonkers branch of the New York and Putnam Railroad and the Third Avenue Railway trolley lines, and these buildings still remain although now served by the Bee-Line Bus System. The railroad companies themselves built neighborhoods of mixed housing types ranging from apartment buildings to large mansions in areas like Park Hill wherein the railroad also built a funicular to connect it with the train station in the valley. This traditionally African-American and white area has seen a tremendous influx of immigrants from Mexico, Central America, the Caribbean, South Asia, and the Middle East. Off South Broadway and Yonkers Avenue one can find residential neighborhoods, such as Lowerre, Nodine Hill, Park Hill, and Hudson Park (off the Hudson River) with a mix of building styles ranging from dense clusters of apartment buildings, blocks of retail with apartments above, multifamily row houses, and detached single-family homes. Other neighborhoods of these types, although with a larger number of detached houses, are Ludlow Park, Hudson Park and Van Cortlandt Crest, off Riverdale Avenue, right over the Riverdale border - the former alongside the Hudson River. 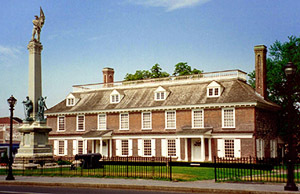 The area is also home to significant historical and educational institutions including the historic Philipse Manor Hall (a New York State Historic Site that houses one of three papier mache ceilings in the United States), The Science Barge, Beczak Environmental Education Center, and a 2003 Yonkers Public Library. Yonkers is typically a Democratic stronghold just like the rest of Westchester County and most of New York state on the national level. In 1992, Yonkers voted for George H. W. Bush over Bill Clinton and Ross Perot for president, but has voted solidly Democratic ever since. At a local level, recent mayors of Yonkers have included Republicans Phil Amicone and John Spencer, while the Yonkers City Council has mostly been controlled by Republicans. In the State Assembly, Yonkers is represented by Democrats J. Gary Pretlow and Shelley Mayer, and in the New York State Senate, by Democrats Andrea Stewart-Cousins and George Latimer. At the federal level, Democratic representative Eliot Engel represents the city. Yonkers is served by two heavy-rail commuter lines. Hudson Line Metro-North Railroad stations provide commuter service to New York City: Ludlow, Yonkers, Glenwood and Greystone. The Yonkers station is also served by Amtrak. Several Harlem Line stations are on or very near the city's eastern border. These include Wakefield, Mt. Vernon West, Fleetwood, Bronxville, Tuckahoe and Crestwood. A third commuter line dating from the late 19th century, the Putnam Division, was shut down in phases with the final passenger trains making their last runs in May 1958. The main line of the former New York and Putnam Railroad running through the middle of Yonkers has been converted into a paved walking and bicycling path, called the South County Trailway. It runs north-south in Yonkers from the Hastings-on-Hudson border in the north to the Bronx border in the south at Van Cortlandt Park where it is unpaved as of 2014 and is referred to as the Putnam Trail. The city of Yonkers is protected by 459 firefighters of the city of Yonkers Fire Department (YFD), under the command of a Fire Commissioner and 3 Deputy Chiefs. Founded in 1896, the YFD operates out of 11 Fire Stations, located throughout the city in 2 Battalions, under the command of 1 Assistant Chief per shift. The Yonkers Fire Department also operates a fire apparatus fleet of 10 Engines, 6 Ladders, 1 Squad, 1 Rescue, 1 Fireboat, 1 Air Cascade Unit, 1 USAR (Urban Search And Rescue) Collapse Unit, 1 Foam Unit, 1 Haz-Mat Unit, and numerous other special, support, and reserve units. The YFD responds to approximately 16,000 emergency calls annually. ^ "2016 U.S. Gazetteer Files". United States Census Bureau. https://www2.census.gov/geo/docs/maps-data/data/gazetteer/2016_Gazetteer/2016_gaz_place_36.txt. Retrieved July 5, 2017. ^ a b "American FactFinder". United States Census Bureau. Archived from the original on September 11, 2013. https://web.archive.org/web/20130911234518/http://factfinder2.census.gov/. Retrieved January 31, 2008. ^ "Yonkers". Collins Dictionary. n.d.. http://www.collinsdictionary.com/dictionary/american/yonkers?showCookiePolicy=true. Retrieved September 24, 2014. ^ a b "Annual Estimates of the Resident Population: April 1, 2010 to July 1, 2016 Population Estimates Yonkers city, New York". United States Census Bureau. https://factfinder.census.gov/bkmk/table/1.0/en/PEP/2016/PEPANNRES/1620000US3684000. Retrieved September 8, 2017. ^ Erik (August 19, 2009). "Interactive Map: Dutch Place Names in New York | Dutch New York". Thirteen.org. http://www.thirteen.org/dutchny/interactives/dutch-place-names-in-new-york-city/6/. Retrieved September 16, 2011. ^ Kinlock, Ken. "New York Central\'s Putnam Division". kinglyheirs.com. http://www.kinglyheirs.com/AbandonedRR/Putnam1.html. ^ Heitman, Charles E. (1911). "The Home Problem in Great Cities and How Engineering Achievement is Solving It". ^ "Wants Subway Extended: Yonkers Mayor to Ask City to Take Over N.Y.C. Branch". New York Times. June 27, 1942. http://query.nytimes.com/mem/archive/pdf?res=9D06E7D9173EE13BBC4F51DFB0668389659EDE. Retrieved August 17, 2015. ^ a b c d e "New York - Race and Hispanic Origin for Selected Cities and Other Places: Earliest Census to 1990". U.S. Census Bureau. https://www.census.gov/population/www/documentation/twps0076/twps0076.html. ^ "Riverdale Hatzalah". riverdalehatzalah.org. http://www.riverdalehatzalah.org/. ^ "Sherwood Park Cemetery, Yonkers, Westchester County, New York, United States - Nearby Cities, Nearby Cemeteries and Genealogy Resources - Histopolis". Test.histopolis.com. November 21, 2012. http://test.histopolis.com/Place/US/NY/Westchester_County/Sherwood_Park_Cemetery. Retrieved March 12, 2013. ^ "Wordsmith.org -- Online Chat with Paul Dickson". wordsmith.org. http://wordsmith.org/chat/dickson.html. ^ a b "Yonkers (city), New York". State & County QuickFacts. U.S. Census Bureau. http://quickfacts.census.gov/qfd/states/36/3684000.html. ^ "American Fact Finder". U.S. Census Bureau. Archived from the original on May 20, 2011. https://web.archive.org/web/20110520164400/http://factfinder2.census.gov/faces/tableservices/jsf/pages/productview.xhtml?pid=DEC_10_PL_QTPL&prodType=table. Retrieved March 24, 2011. ^ "Yonkers Victorian Homes". victoriansource.com. http://www.victoriansource.com/id4.html. ^ "Welcome to the Yonkers Public Library!-Hours and Directions". Ypl.org. December 7, 2008. Archived from the original on July 29, 2008. https://web.archive.org/web/20080729014156/http://www.ypl.org/hoursanddirec.htm#RIV. Retrieved May 6, 2009. ^ Johnson, Liz (Feb 3, 2010). 'No Reservations' Hudson Valley Style: Tony Bourdain and Bill Murray Dine at X20. "Small Bites: Food Finds in the Lower Hudson Valley". Accessed February 6, 2011. ^ "Sarah Lawrence College. A Deeper Education.". http://www.slc.edu/. Retrieved June 20, 2013. ^ haasdesign: Renee Haas. "History". The Village of Bronxville. Archived from the original on November 11, 2012. https://web.archive.org/web/20121111030818/http://www.villageofbronxville.com/sube2_history13.htm. Retrieved March 12, 2013. ^ "Page not found - Westchester Community College". sunywcc.edu. http://www.sunywcc.edu/locations/yonkers/cross-county/. ^ "本校の歩み." The Japanese School of New York. Retrieved on January 10, 2012. "1980.12.22 Queens　Ｆlushing校に移転。" and "1991.8.18. Westchester Yonkers校へ移転。" and "1992.9.1 Connecticut Greenwich校へ移転。 授業開始。"
^ "Bee-Line System On-Board Survey". http://transportation.westchestergov.com/images/stories/Planning/onboard_survey_2011.pdf. ^ Strauss, Michael (September 13, 1981). "MEMORIES CLICK ALONG THE PUTNAM LINE". The New York Times. https://www.nytimes.com/1981/09/13/nyregion/memories-click-along-the-putnam-line.html. ^ "List of Fire Department Apparatus; City of Yonkers.". http://www.yonkersny.gov/Index.aspx?page=998. ^ "Brick by Brick: A Civil Rights Story". California Newsreel. Archived from the original on July 17, 2015. https://web.archive.org/web/20150717182138/http://newsreel.org/video/brick-by-brick. Retrieved August 7, 2015. ^ "Tyler, The Creator Gets Odd In 'Yonkers'". Rapfix.mtv.com. February 11, 2011. http://rapfix.mtv.com/2011/02/11/tyler-the-creator-gets-odd-in-yonkers/. Retrieved March 12, 2013. ^ "Final filming for 'Show Me A Hero' underway in Yonkers". News 12. http://westchester.news12.com/news/final-filming-for-show-me-a-hero-underway-in-yonkers-1.9783549. Retrieved June 19, 2015. ^ Hodara, Susan (October 26, 2008). "Communities; Cities Find Sisters Abroad". © The New York Times. https://query.nytimes.com/gst/fullpage.html?res=9F0DE2DD143FF932A3575AC0A9649C8B63&sec=&spon=&pagewanted=all. Retrieved October 26, 2008. This page uses content from the English language Wikipedia. The original content was at Yonkers, New York. The list of authors can be seen in the page history. As with this Familypedia wiki, the content of Wikipedia is available under the Creative Commons License.